If you had a longer commute than usual yesterday in San Francisco, this might just be the reason why–17 grazing goats escaped through a fence and ended up on the streets near Highway 101. Thankfully, no man, or goat was harmed. According to a Bay Area NBC affiliate, the goats were grazing near Highway 101 when they escaped through fencing that was supposed to keep the goats enclosed. One ended up making it on to the Highway but was able to be removed safely. The goats were rounded up by a goat herder, who first attempted to transport them using a pickup truck, but had to return with a trailer when the goats got spooked and nearly escaped. 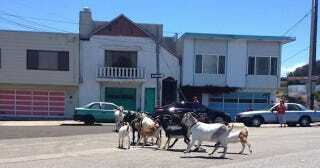 San Francisco Police shut down traffic in the neighborhood so the goats could be rounded up safely. It's unclear as to whether the goats made sounds like these as they roamed the streets of SF.